Good morning! So, today I have some fun news. I spent all weekend redoing every single chapter cover that had previously been black and white. It was a lot of work, but also a lot of fun. I’m not replacing them in the archive right away, but they will be replaced in time as I re-size the book versions of each chapter and replace those pages. You can see one of them right now for Henri’s sidestory, which, if you read through you will notice looks much nicer, and much cleaner. I’m aiming to replace one chapter a week, and with each of those chapters, I’ll be releasing the new chapter cover as a wallpaper set for you! You can find this week’s wallpaper by following the instructions on this page. 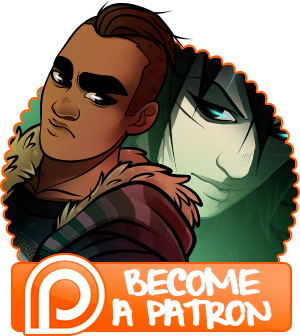 Also, if you’re a patron I just posted some exclusive previews of the finished covers for chapters ten and nine. Don’t forget to vote for who’s gonna end up on July’s reader’s choice wallpaper! That aside, I’m just finishing up adding the word balloons to the next batch of pages tomorrow, and then it’s 4 more pages left in the chapter to colour and I get to finally start on the next one. Anyhow, enjoy today’s page, we’ll be back on Friday!